MONROVIA – If the June 7 protest against the harsh state of the economy and ‘bad governance’ should go on without disruption, organizers would have to seek permission from the appropriate government entities, the deputy presidential press secretary has warned. The protest since announced by talk show host Henry Costa to be led by the ‘Council of Patriots’ last week has been gaining massive momentum with many prominent and ordinary Liberians volunteering to form part of the march. Representative Yekeh Kolubah, Senator Oscar Cooper, Senator Sando Johnson, Cllr. Pearl Brown Bull and Darius Dillon are amongst prominent citizens who have opted to join the march against what is believed to be the constant violation of the Liberian Constitution. The protest has been dubbed “Save the State”. At a press conference on Tuesday, deputy presidential press secretary told reporters that President Weah is concern about the security of the state and therefore encourages all Liberians to remain peaceful. “The government will not lecture people on civics; people who are requesting know their constitutional obligations and the Government of President George Manneh Weah will not infringe on the rights of people. But there is a laid down procedure to assemble people, especially when you are opting to take a public space,” Toby said. He added that the government is yet to receive any formal request to stage a street protest, neither has the office of the President been written concerning any protest. “I’m sure you are hearing it the way we all are hearing it on the social media. The callers of the protest should communicate their request through the Ministry of Justice asking the Ministry of Justice to grant them that request because it is their right to call on their government. The government is equally responsible to protect the peace of the country – that is a bigger picture,” Toby said. Toby warned that should the protest turns on the “opposite”, the organizers would be held liable. “The government will leave no stone untouched if the protest or protesters turn violent and the leaders of the protest will account to Liberians for whatever that happens on the contrary,” Toby said. He, however, added that government would provide security if the protest would remain peaceful. “President Weah is taking some of the criticisms in good fate and it’s helping in good governance, except that some are very rude and sending bad signals out there to our partners, but the international community is watching the government in term of its good governance,” Toby asserted. He said President Weah is concern about everything people are talking about but he will not get distracted by those who want him to do things according to their dictates. 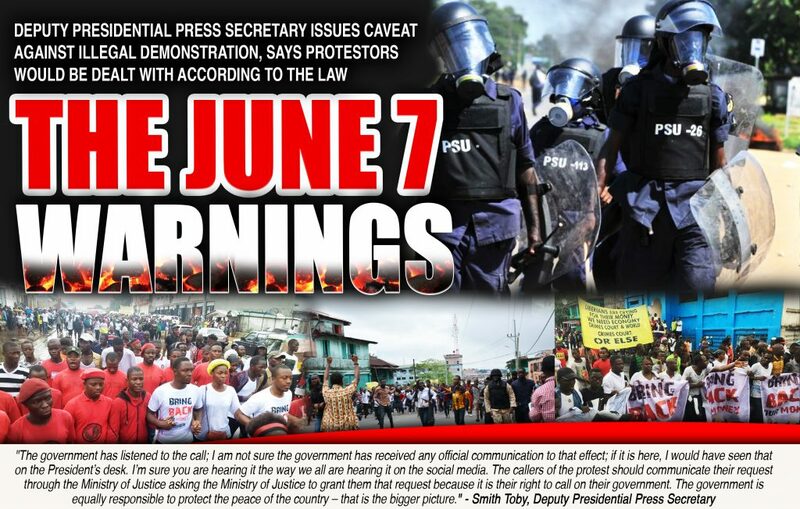 In an earlier comment, Mr. Darius Dillon, Liberty Party’s vice president for operations, said the government will have to be blamed if the protest turns ugly on June 7. “As for reported counter demonstration on 7th June, we will hold the President, the Minister of Justice, Police Director and the CDC leadership for any recklessness and intrusion into our rally by their surrogates. We will inform the world about this,” stated. Dillon’s comments were in reaction to Minister of State Mr. Nathaniel McGill who pointed accusing fingers to the leaders of the collaborating Liberty Party, (LP), the Alternative National Congress (ANC), and the All Liberian Party (ALP) for masterminding the planed protest.